Thinking outside the box doesn’t always work in franchising. Business guru’s and coaches will often encourage thinking outside of the box. So called “blue sky thinking”. Well that may work for some but it’s not your typical franchisors cup of tea. When you join a franchise brand there’s no need for all that risky experimentation. If you think inside the box all the answers are already there for you. In fact you don’t even need to think inside the box because your primary role is to follow a blueprint. As a result by joining a (proven) franchise brand there is no leap into the dark unknown. You see franchising is replicating what is proven to already work. So, think inside the box. Or to be more precise follow the franchisors business blueprint. When you invest in a franchise you’ll be trained to do that. However you’ll need to bring your personal skills to the party, and of course your investment. But in exchange for that a good franchisor will assist you to create a business that replicates what is working in the hands of other franchisees. I’m going to contradict myself now. Your role as a franchisee is to follow the well trodden path. Your franchisor has already fallen flat on their face, wasted money and ended up learning a lot. That’s what has gone into your franchise. So don’t think you can immediately reinvent the wheel. If that’s what you want to do then don’t buy a franchise. There are exceptions though and all good franchisors will listen to your crazy ideas and your clever ones. I was sad to hear of the death of Michale Delligatti. 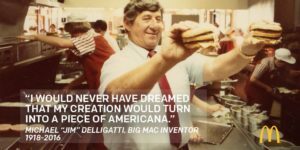 You’ve probably never heard of him but he’s the guy who invented the Big Mac. He was a Mcdonalds franchisee and here’s his story. He did follow the format and created the business, and then he improved it. Mcdonalds were wise to listen to him. You’ll notice though that he already earnt the right to suggest something new. I think he still decided to think inside the box because he just extended what was already working. One of the things we do at Lime Licensing Group is to help franchisors to optimise franchise networks. We also discuss initial and ongoing training and even suggest a minimum contact strategy. When you join a franchise the franchisor will invest their time teaching you what to do and how to do it. Some franchisor training is a matter of a few days, some takes many weeks. You’ll be a newbie which means not everything will sink in first time. Therefore many franchisors extend the training well into the distance with you. So that’s an initial training period followed by a long hand hold going forward. An Operational manual details the day to day operations and what you are supposed to be doing all the time. A franchise agreement details the legal engagement and contractual terms. Hopefully a member of the franchisors staff preaches the gospel to you regularly once you’ve been trained. Repetition is the master of skill and all franchisors want you to learn the format. My advice to you is to learn the format, memorise the Operational manual, and clone the system! You can think outside of the box once you’ve done that. Lime Licensing Group similarly doesn’t take many risks with the advice and implementation of franchise strategies and techniques for our franchise clients. We focus on what has, and is, proven to work. We have metrics that monitor what is happening here and now in the franchise industry. If you are a new franchisor and it’s not quite working then call us for a chat. We can help you. If you are a franchisee who is thinking of joining a franchise system then definitely call us because we’ll help you free of charge.